Francois Moutin was born in Paris. His early interest in music was encouraged by his parents. At age 5, Francois began studying guitar, then piano by age 11. The acoustic bass became his most lasting passion as a teenager. Also studying mathematics and physics, Francois received a college degree in engineering and earned a doctorate in physics at the age of 24. Then he elected to become a professional musician. Three years later, as a member of the legendarey Martial Solal's Trio, Francois was recognized as one of the finest young bass players in Europe. At 29, he began co-leading the Quintet Moutin with his twin brother Louis, a top echelon Jazz drummer. This project has evolved into the Moutin Reunion Quartet. With this band, the brothers are touring extensively around Europe and the United States. The third album of the Moutin Reunion Quartet "Something Like Now" (after "Power Tree" and "Red Moon"), was released in September 2005. When he was still living in Paris, Francois worked non-stop with the greatest musicians of this age : Martial Solal, Michel Portal, Antoine Herve, Daniel Humair, André Ceccarelli, Eric Lelann, Jean-Michel Pilc, Christian Escoude. He has also performed with Peter Erskine, Randy Brecker, Niels Lan Doky, Mino Cinelu, Dave Liebman, John Abercrombie, Toots Thielemans, Didier Lockwood, Larry Schneider, Aldo Romano, James Moody, Terry Lyne Carrington, Richard Galliano, Bernard Lubat, Aaron Scott, George Brown, Sunny Murray, Michel Legrand, Archie Shepp, Claude Nougaro, Trilok Gurtu, Bob Berg, Birelli Lagrene, Wladimir Kosma, Marius Constant, Markus Stockhausen, L'ensemble Inter Contemporain. François has performed in every important European Jazz Festival, and he has toured in over 30 countries around the world. In November 1997, Francois moved his base to New York where he has found steady work in live performance and studio sessions with the premier artists on the New York Jazz Scene. A partial list of their names reads like the yellow pages of Jazz : Franck Wess, Jimmy Heath, Monty Alexander, Benny Powell, Don Alias, Mike Stern, Lew Soloff, Steve Kuhn, Joe Locke, Billy Hart, Jeff Tain Watts, Victor Lewis, Billy Drummond, Richie Beirach, Dave Liebman, Oliver Lake, Harry Belafonte, Odean Pope, James Hurt, Ari Hoenig, Jean-Michel Pilc, Rick Margitza, Franck Kimbrough, Joel Frahm, Greg Tardy, Gene Jackson, Dave Binney, Rudresh Mahanthappa, Vijay Iyer, Adam Rogers, David Gilmore, Ben Monder, John Hart, Billy Drews, Jamie Haddad, Steve Hass Bob James… Francois has also recorded and performed with Arab Music star Simon Shaheen. 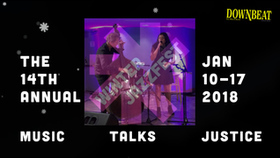 He is a familiar presence on the stages of such establishments as Sweet Rhythm, Jazz Standard, Birdland, Village Vanguard, Blue Note, Knitting Factory, Zinc Bar, Jazz Gallery, Tonic, Smoke, Lincoln Center, Town Hall, New York Symphony Space, Museum of Modern Art. François has also appeared in some major Jazz Festivals around the coutry like Newport JVC Jazz Festival, Bell Atlantic Jazz Festival in New York, Freihoffer Jazz Festival in Saratoga Spring, Detroit Jazz Festival, Monterey Jazz Festival, San Francisco Jazz Series, or Kansas City Jazz Festival. 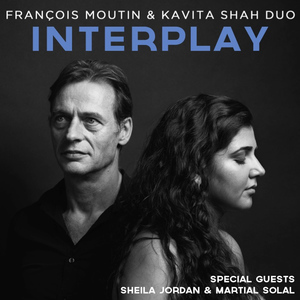 Francois Moutin & Kavita Shah - Interplay is an improvisational journey across lyric-driven and wordless pieces alike. 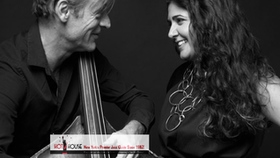 Together, Moutin and Shah embrace virtuosity, spontaneity, and lyricism through a repertoire of standards and original music adapted to the unique instrumentation of acoustic bass and voice. The album, recorded at Sear Sound Studios in New York and Le Studio de Meudon in Paris, features 11 tracks ranging from classics like 'dith Piaf's "La Vie en Rose" to instrumental songs like Dafnis Prieto's "Blah Blah" to original compositions by Shah and Moutin. Sheila Jordan, musical descendent of icon Charlie Parker and ever-burning flame among jazz singers, pioneered the bass-voice duo in 1977 with the SteepleChase album Sheila in collaboration with Arild Andersen. She went on to solidify the exchange as her signature sound, most notably with Harvie S and Cameron Brown, producing multiple recordings and scores of performances throughout the ensuing decades. 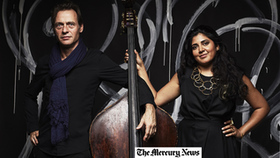 Today, the heir apparent of these musical duo explorations is singer Kavita Shah. 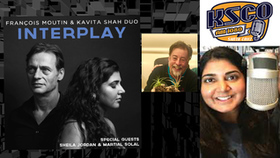 In February Shah released her second album, Interplay (Dot Time), a gracious, informed nod to Jordan's legacy. Jordan had become a mentor to Shah after a chance meeting on the subway during a time when Shah was considering her career options. The subsequent friendship between the women seems to have tipped Shah toward a life in song-good news for the music world. (In addition to performing, Shah researches and writes about musical traditions the world over.) 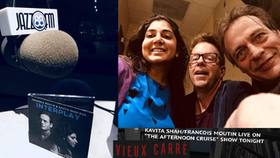 On the record Shah partners with bassist François Moutin on a mix of 11 standards ("You Go To My Head" and "La Vie En Rose") and originals ("Aigue Marine" and "Coming Yesterday", both with pianist Martial Solal). Her skilled jazz phrasing and clear, deep voice distinguish her among new singers on the ascent-what a way she has with a tune, be it a songbook favorite or a wordless vocalese. Jordan puts in a guest appearance, reprising her own classic, "Falling In Love With Love", the opening track from her 1963 debut album, Portrait of Sheila (Blue Note). On Shah's version, the singers trade choruses and 4s, sometimes on the lyrics, sometimes scatting, each in her own vocal style-related, but not imitative. With this album Shah is firmly planted as a jazz singer at the center of many cultural influences. 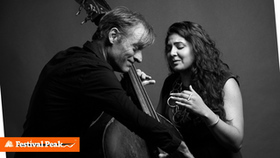 The François Moutin & Kavita Shah Duo project is a meeting of minds and spirits, one that embraces virtuosity, spontaneity, and lyricism through a repertoire of standards and original music adapted to the unique instrumentation of acoustic bass and voice. 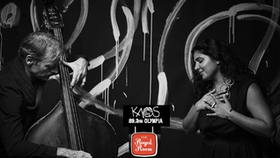 At Hungry Brain, François and Kavita will present their first record "Interplay," released in February 2018 on Dot Time Records. 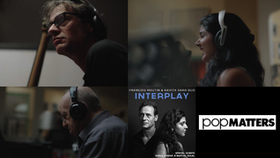 "Interplay," recorded at Sear Sound Studios in New York and Le Studio de Meudon in Paris, features 11 tracks ranging from classics like Edith Piaf's "La Vie en Rose" to instrumental songs like Dafnis Prieto's "Blah Blah" to original compositions by Shah and Moutin. The album also features special guests NEA Jazz Master Sheila Jordan on vocals, considered by many as the pioneer of the bass-and-voice duets, and legendary French pianist Martial Solal. 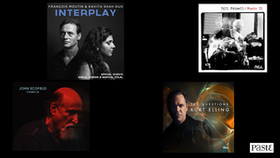 The result is an improvisational journey across lyric-driven and wordless pieces alike. 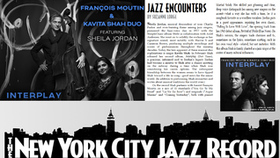 Moutin and Shah will play Friday, April 6, 2018, at the Royal Room, as part of Earshot Jazz Presents.